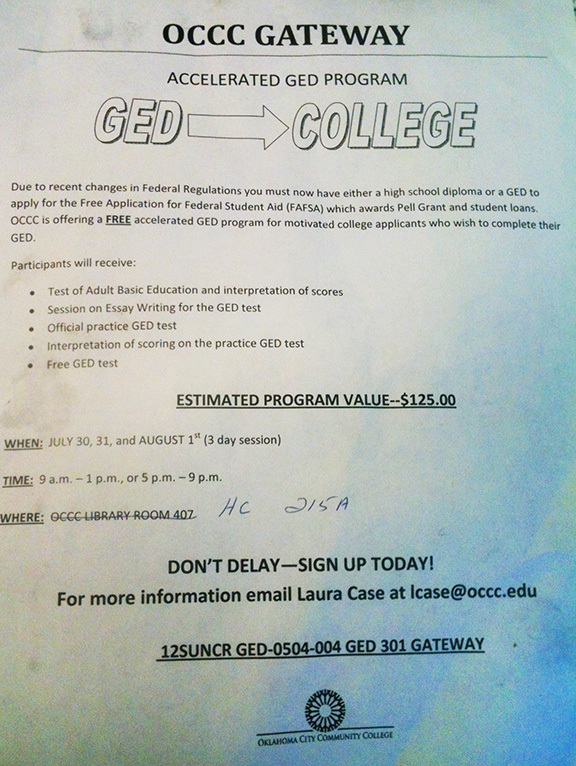 A copy of the circulated flyer, which shows the OCCC Gateway program includes a free GED test. Click here  to view a larger version of the flyer. UPDATE: For an update to this story, click here . Prospective student Christina Yeager said she prepared well in advance — making arrangements at her job and for her children to be cared for — so she could attend OCCC Gateway, a three-day program designed to help students earn their GED by offering learning sessions, practice tests and the GED test itself — all no charge. But when Yeager showed up for her first class Monday morning, July 30, Professor Pamela McGee put a kink in those plans when she told the class there was a change — students would not be able to take the GED test for free as advertised. Instead, they would only be given a $20 discount off the $60 test. As of her Tuesday class the next morning, Yeager said, that number had already dwindled down to nine. Although Yeager said she will continue with the class as planned, she said the cost will “definitely” set her back. “I might not even be able to start school this semester,” she said. Due to recent financial aid changes requiring students to have either a high school diploma or GED to apply for Pell Grants and student loans, Yeager said, she was directed to the Gateway program by OCCC’s Advising department. Yeager said although OCCC had her contact information, including her address and telephone number, the college failed to notify her — as well as her classmates — of the change. Tanner Hodgins said he experienced the same situation during the Gateway program’s first nighttime session, also held July 30. Even though there were only about a dozen students in his class, he said, McGee said the new stipulation couldn’t be changed. “People were looking around the room, looking at each other in shock,” Hodgins said. “Three people just got up and left. “[McGee] called a break and people just went to their cars, drove off and never came back. He said although he has “no choice” but to go through with the class, he believes OCCC should offer the test for free, as advertised. Hodgins said no one in his class was contacted about the changes. Attempts to contact multiple college officials tied to the GED program have been unsuccessful. Keep checking back for updates to this story.